I spend every day zooming from one obsession to the other, with no stops in between or "breaks", except for when the engineering manager's wife sends a cake to work for someone's birthday. Then I stop thinking for the 3 seconds it takes for me to inhale cake. This week somehow I ended up obsessively thinking about potager gardens and free range chickens. Google "potager" if you don't know what that is. 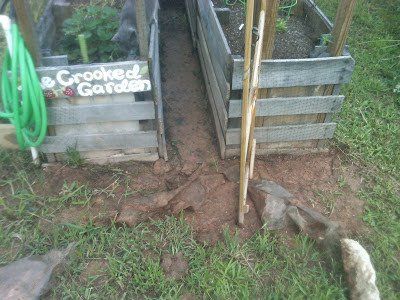 My daughter and I had to dig out the Crooked Garden from the 3 inches of mud that have accumulated due to our 50,000 rainstorms this summer. Let me tell you how evil landscape fabric is. Stupid stupid. I wish I had not bothered with this stuff, all the mud washed underneath it, and then we couldn't get the door open or closed. Finally i used my box cutter and tore it all out. Then I got this wild hair that we should try to make this whole backyard into a potager garden! Mostly because the backyard is a mudpit so I would have to buy sod, and neither sod nor mowing more grass really appeals to me right now. Because beach house. Behold! The first box in our potager garden! Did you notice that I just dragged some leftover deckboards out from under the deck and threw this together? That it's treated wood and I totally forgot about that in my potager fever? And now. The dangling watermelon. 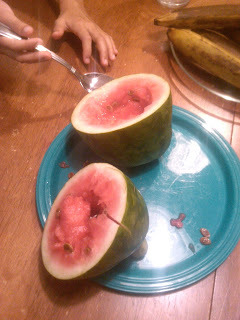 It just didn't get any bigger so we picked it, let it sit on the counter for a week, and then decided to crack it open. No, you definitely should not plant in an area with treated lumber. Its even recommended that you don't plant down wash from a treated deck. Depending on when the boards were made, they could have arsenic in them. Wanna know something else interesting that weed block can do? Make a terrific hiding place for ants! It was so bad that we decided to just roll it up and get it out of the flower bed. Now of course we don't have anything else to put in there so I have this lovely curved bed with cute pavers spaced in front of my 2 ridiculous rosebushes and it's all tied together nicely by the bare mud/dirt. Eventually it'll get fixed, but until then, we know how to look classy, lol. 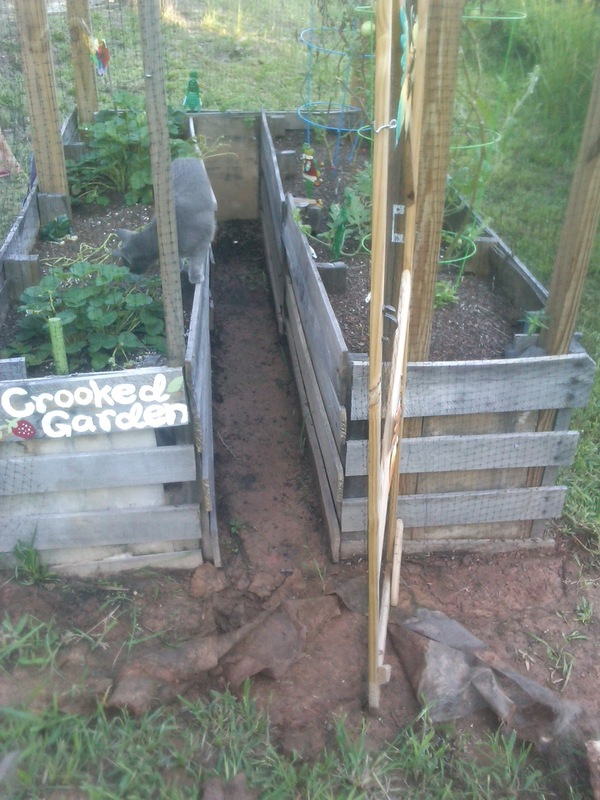 So it never occurred to me or anyone else around here that uses them but railroad ties are cheap and make the best boxes for small garden beds. I'm afraid to find out how bad for our health that decision was. What a beautiful garden. It's crazy how expensive gravel is. Your watermelon is amazing. The biggest I was ever able to grow one was the size of a grapefruit. railroad ties are covered in creosote! is that a bad thing? I've seen people use them for garden beds too, but if regular treated lumber is poisonous, how can creosote covered railroad ties be okay?? Katy, you crack me up! I love how you don't give up though :) See you have more determination than I do. 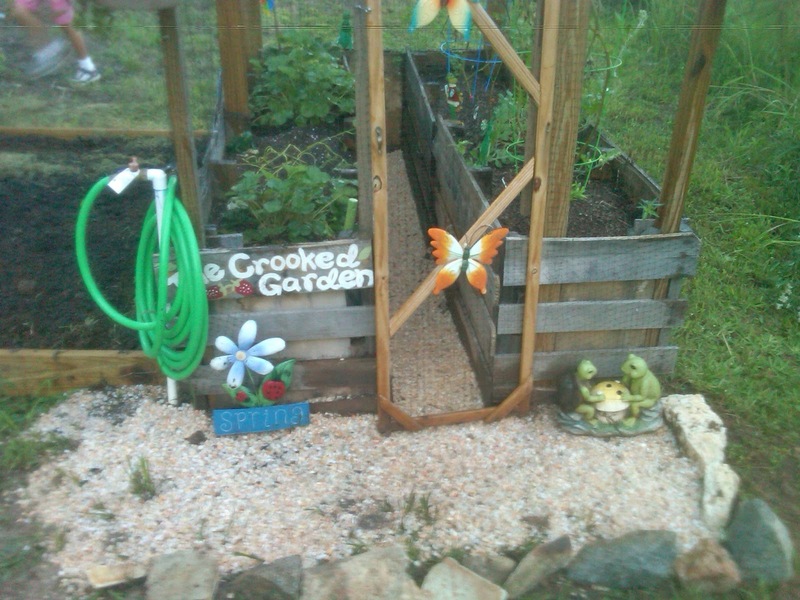 So far, I've just "talked" and whined about wanting a garden but haven't actually gotten out there and started one. Good luck with your mud. We've been in a drought here so most gardens around here have literally shriveled up. I was just complaining about not knowing how to do the things that you are doing! Can you give me some reality based beginner resources to check out? Please keep in mind, I grew up as a ballerina, not a builder! I'd love to pass your blog along so that everyone could see your awesomeness:) Do you have a FB page? 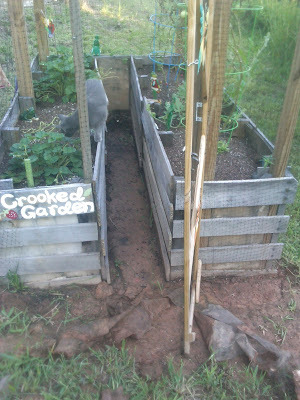 I used cedar fencing for my garden boxes, then saw that Ana White did also. I've read that neither treated lumber nor RR ties are safe. Well it's curious about the RR ties - I see people using them everywhere. 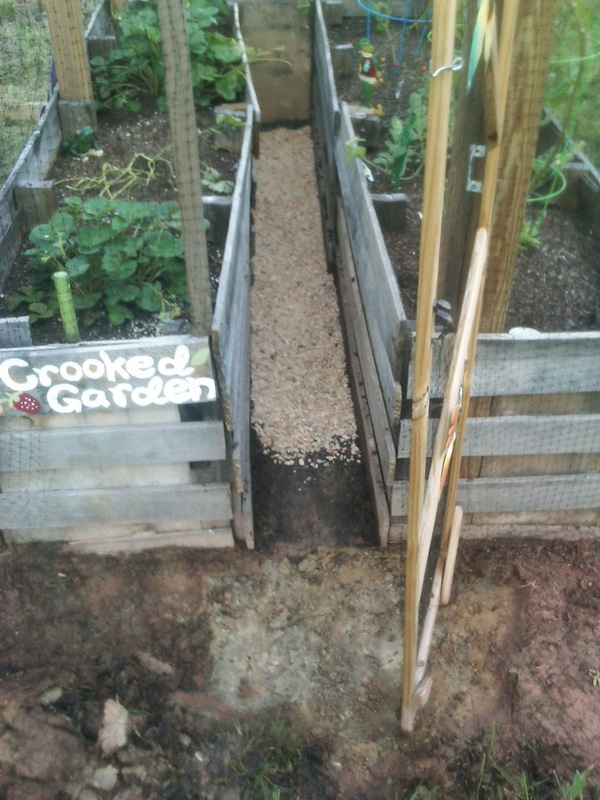 Maybe I'll just shove some untreated lumber scraps down between the pieces I used and the soil. Like a barrier. maybe. Andi - beginner resources. Honestly, if I don't know how to do something I google it or YouTube it. That's my go-to resource. Hi Katy - Check out landscape ties (not railroad ties!) They are untreated and meant specifically for landscaping. We bought ours at a local lumber yard. We used them to boarder a patio that is filled with crushed stone, but I think they are ok for garden's too. I have read many of your blogs and enjoy what you get up to with your ducklings, golf cart etc. I live in New Zealand and have used treated wood in my garden for a long time. To be honest I think the worry about all the chemicals in the wood is a bit silly, considering most store brought veggies are covered in more sprays than what woud leech into your soil or plants. If you are worried line the wood with old weed matting, the main thing is to keep the soil full with organic matter grass clippings are amazing and rot down fast it will always be fresh and healthy soil. More than a few years ago arsenic was outlawed in treated lumber. This is not timely information, just old information. Playgrounds, decks, etc., were the issue. Now, if you're using reclaimed treated lumber, you might have a worry and better safe than sorry. Don't use this lumber for food-bearing gardens. The same for RR ties. Creosote prevents rot, of course, but if you're going to eat your produce, don't use them. As suggested, get garden timbers. 6x6s also work very well, but you're going to face some rot, so get used to the idea. You're not supposed to throw dog or cat poop into your gardens for the same reasons. If you grow ornamentals (as I do) and nothing edible, throw it all in there. It's all fertilizer and things go very well! 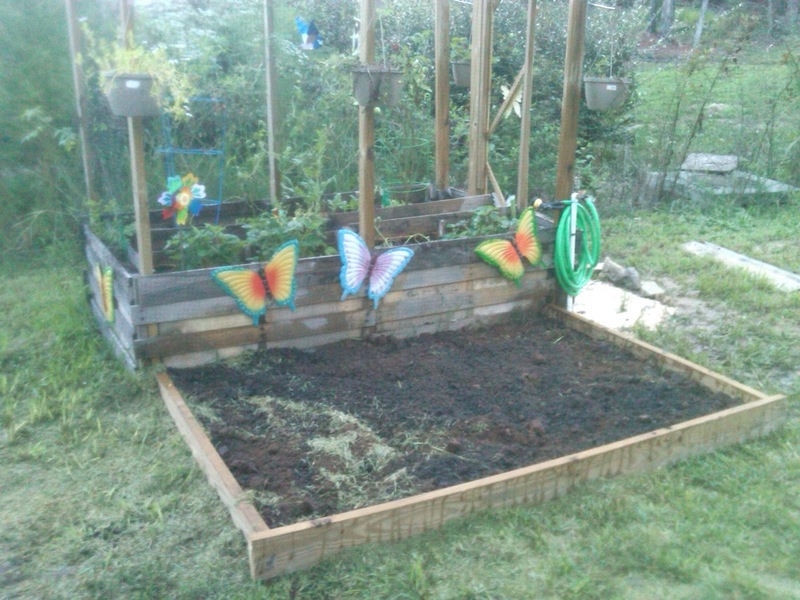 Search "lasagna gardening" for filling the beds with in-place compost. I've even done this with wood chips from the county tree-chopper-downers. Whatever they're called. Within the season, the layer of wood disappears. It's healthy and rich. And you can say you "made" that dirt! Christine - I saw that lasagna gardening and that's what I did here! a layer of grass clippings, then peat moss, some fertilizer, and now more grass clippings. super easy!